Mfecane (isiZulu, Zulu pronunciation: [m̩fɛˈkǀaːne][note 1]), also known by the Sesotho name Difaqane or Lifaqane (all meaning "crushing, scattering, forced dispersal, forced migration"), was a period of widespread chaos and warfare among indigenous ethnic communities in southern Africa during the period between 1815 and about 1840. As King Shaka created the militaristic Zulu Kingdom in the territory between the Tugela River and Pongola River, his forces caused a wave of warfare and disruption to sweep to other peoples. This was the prelude of the Mfecane, which spread from there. The movement of people caused many tribes to try to dominate those in new territories, leading to widespread warfare; consolidation of other groups, such as the Matebele, the Mfengu and the Makololo; and the creation of states such as the modern Lesotho. Mfecane refers to the period when Mzilikazi, a king of the Matebele, dominated the Transvaal. During his reign, roughly from 1826 to 1836, he ordered widespread killings and devastation to remove all opposition. He reorganised the territory to establish the new Ndebele order. The death toll has never been satisfactorily determined, but the whole region became nearly depopulated. Normal estimates for the death toll range from 1 million to 2 million. "In the seventy years or so after 1760, the political face of the region north of the Orange (River) and east of the Kalahari was profoundly changed," concluded Professor John Wright. Theories vary as to the causes of the catastrophic warfare and migration of many ethnic groups in the area. Populations had increased greatly in Zululand following the Portuguese introduction of maize in from the Americas in the late 17th century, reaching the inland around 1750. While maize was more productive than the grains from native grasses, it required more water during cultivation. The agricultural surpluses and increased population enabled Shaka to raise a standing army of Zulus. By the end of the 18th century, the Zulus occupied much of their arable land. Declining rainfall and a ten-year drought in the early 19th century set off a competition for land and water resources among the peoples of the area. Other possible causes were the Zulus' adoption of new tactics and weapons during this period. Instead of using throwing spears, the Zulus used broad-bladed, stabbing spears known as iklwa, which were deadly in close combat. The Zulus also instituted a form of conscription, in which every man had to serve the king as soldier in special age regiments, known in English as impis. Many of the Nguni peoples adopted the same practice, putting most of their men under arms. This greatly expanded the scale of regional warfare. Oral history says that after the death of Mvulane, the younger brother of Phungashe, Mvulane's sons Khoboyela and Ngqengelele escaped being killed by Phungashe over their father Mvulane's estate and went to live with Senzangakhona and Ngqengelele. Most of the members of the Buthelezi ethnic group had left with Khoboyela and Ngqengelele. When Shaka attacked the Ngwane, Sobhuza's men were outnumbered by the combination of the Mthethwas, the Buthelezis under Ngqengelele and the Zulus. In summary, the causes of mfecane are; the need for land, population growth in Natal, the Boer trek, Shaka's military and expansionist strategy. In addition, the profitable slave trade through Delagoa Bay (modern day Maputo Bay) is another cause. In about 1817, Chief Dingiswayo of the Mthethwa group in the south near the Tugela River, entered into an alliance with the Tsongas, who controlled the trade routes to Delagoa Bay (now Maputo). This alliance encroached on the routes used by the Ndwandwe alliance, who occupied the region in the north, near the Pongola River. Battles between the allied forces of Chief Dingiswayo and of Chief Zwide, and the Ndwandwe probably mark the start of what became the Mfecane. Zwide defeated the Mthethwa and executed Chief Dingiswayo. Dingiswayo was a mentor to King Shaka. He took him in together with his mother Queen Nandi and gave them refuge. Many of the Mthethwa leaders formed a confederation with the Zulu clan, under the leadership of Shaka. The Zulus conquered and assimilated smaller clans in the area. Zwide attacked King Shaka and was defeated at the Battle of Gqokli Hill which marked the start of Shaka's conquest of the Ndwandwe. The Zulu practice was to absorb only the women and young men of a clan or village. They killed the elderly and men of fighting age; the lucky ones escaped. Having learned Zulu tactics, the escapees in turn descended upon more distant clans unfamiliar with the new order. Around 1821, the Zulu general Mzilikazi of the Khumalo clan defied Zulu king Shaka, and set up his own kingdom. He quickly made many enemies, not only with the Zulu king, but also with the Boers, Griqua and Tswana. Defeats in several clashes convinced Mzilikazi to move north towards Swaziland. Going north and then inland westward along the watershed between the Vaal and the Limpopo rivers, Mzilikazi and his followers, the AmaNdebele, (called Matebele in English) established an Ndebele state northwest of the city of Pretoria. During this period, the Matebele left a trail of destruction in their wake. From 1837 to 1838, the arrival of Boer settlers and the subsequent battles of Vegtkop and Mosega, drove the Matebele north of the Limpopo. They settled in the area now known as Matabeleland, in present-day southern Zimbabwe. Mzilikazi set up his new capital in Bulawayo. The AmaNdebele forced the AmaShona of the region northward and forced them to pay tribute. This caused resentment that has continued in modern Zimbabwe. At the Battle of Mhlatuze River in 1818, the Ndwandwe were defeated by the Zulu led by Shaka. Soshangane, one of Zwide's generals, fled to Mozambique with the remainder of the Ndwandwe. There they established the Gaza kingdom. They oppressed the Tsonga people living there, some of whom fled over the Lebombo Mountains into the Northern Transvaal. In 1833, Soshangane invaded various Portuguese settlements, and was initially successful. But a combination of internal disputes and war against the Swazi caused the downfall of the Gaza kingdom. The Ngwane people lived in present-day Swaziland, where they had settled in the southwest. They warred periodically with the Ndwandwe. Ngwane chief Sobhuza I led his people to higher elevations around 1820 to escape Zulu attacks . In this period, the Ngwane became known as the Swazi; Sobhuza established the Swazi kingdom in what is now central Swaziland . Zwangendaba of the Jele or Gumbi clan son of Nonyanda ka Sguda Jele (according to the information given by the original Gumbi clan of Kwazulu Natal and not kaHlatshwayo as stated by other researchers), a commander of the Ndwandwe army, fled north with Soshangane after his defeat in 1819. Zwangendaba's followers were henceforth called Ngoni. Continuing north of the Zambezi River, they formed a state in the region between lakes Malawi and Tanganyika. Maseko, who led another part of the Ngoni people, founded another state to the east of Zwangendaba's kingdom. To the east, refugees from the Mfecane were assimilated into the Xhosa-speaking groups in present-day Eastern Cape Province, becoming the Mfengu. Subjected to successive waves of attack by other ethnic groups, they were also pressed from the West by the British colonists. Moshoeshoe I gathered the mountain clans together in an alliance against the Zulus. Fortifying the easily defended hills and expanding his reach with cavalry raids, he fought against his enemies with some success, despite not adopting the Zulu tactics, as many other clans had done. The territory of Moshoeshoe I became the kingdom of Lesotho. The Tswana were pillaged by two large invasionary forces set on the move by the Mfecane. Sebitwane gathered the Kololo ethnic groups near modern Lesotho and wandered north across what is now Botswana, plundering and killing many of the Tswana people in the way. They also took large numbers of captives north with them, finally settling north of the Zambezi River in Barotseland, where they conquered the Lozi people. The next force was the Mzilikazi and the Matebele who moved across Tswana territory in 1837. Both of these invasionary forces continued to travel north across Tswana territory without establishing any sort of state. 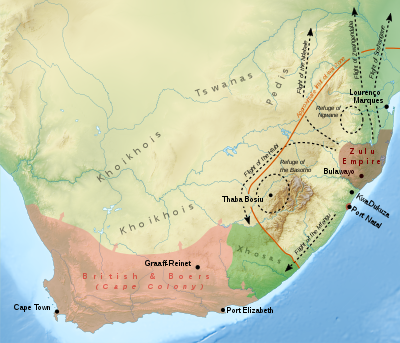 In addition to these major kingdoms, a number of smaller groups also moved north into Tswana territory, where they met with defeat and ultimately vanished from history. In 1988, Rhodes University professor Julian Cobbing advanced a different hypothesis on the rise of the Zulu state; he contended the accounts of the Mfecane were a self-serving, constructed product of apartheid politicians and historians. According to Cobbing, apartheid historians had mischaracterised the Mfecane as a period of internally induced black-on-black destruction. Instead, Cobbing argued that the roots of the conflicts could be found exclusively in the labour needs of the Portuguese slave traders operating out of Delagoa Bay, in modern-day Mozambique, and of the British colonists in the Cape. The resulting pressures led to massive displacement, famine, and war in the interior, allowing later Afrikaner settlers to seize control of most land. Among those involved were European adventurers such as Nathaniel Isaacs (who was later accused of slave trading). Cobbing's hypothesis remains controversial and the discussion about it was called the "Cobbing Controversy". Many agree that Cobbing's analysis offered several key breakthroughs and insights into the nature of early Zulu society. Some critics assert that revisionist theories such as Cobbing's placed too much weight on environmental factors and ignored the key roles played by dynamic human agents such as the Zulu king Shaka. The historian Elizabeth Eldredge challenged Cobbing's thesis on the grounds that there is scant evidence of the resumption of the Portuguese slave trade out of Delagoa Bay before 1823, a finding that undermines Cobbing's thesis that Shaka's early military activities were a response to slave raids. Moreover, Eldredge argues that Griqua and other groups, rather than the British colonists, were primarily responsible for the slave raids coming from the Cape. Eldredge also asserts that Cobbing downplays the importance of the ivory trade in Delagoa Bay, and the extent to which African groups and leaders sought to establish more centralised and complex state formations to control ivory routes and the wealth associated with the trade. She suggests these pressures created internal movements, as well as reactions against European activity, that drove the state formations and concomitant violence and displacement. ^ In another tradition transcribed [m̩fɛˈʇaːne]. ⟨ǀ⟩ is the current IPA symbol for a dental click, not a lower-case ⟨L⟩. ^ "General South African History Timeline: 1800s". South African History Online. Retrieved 12 September 2014. ^ Wright, John; Cobbing, Julian (12 September 1988). "The Mfecane: Beginning the inquest". Wits Institutional Repository African Studies Institute - Seminar Papers. ^ Walter, Eugene Victor (1969). Terror and Resistance: A Study of Political Violence, with Case Studies of Some African Communities. ^ Beach, David N. (1983). "The Zimbabwe Plateau and its Peoples". In Birmingham, David; Martin, Phyllis M. (eds.). History of Central Africa, volume 1. London: Longman. pp. 245–277. ISBN 978-0-582-64673-5. ^ Becker, Peter (1979). Path of Blood: The Rise and Conquests of Mzilikazi, Founder of the Matebele ethnic group of Southern Africa. Penguin. ISBN 978-0-14-004978-7. ^ a b Segolodi, Moanaphuti (1940). "Ditso Tsa Batawana". ^ a b Tlou, Thomas (1985). A History of Ngamiland, 1750 to 1906: The Formation of an African State. Macmillan Botswana. ^ Cobbin, Julian (1988). "The Mfecane as Alibi: Thoughts on Dithakong and Mbolompo". The Journal of African History. 29 (3): 487–519. doi:10.1017/s0021853700030590. ^ Herrman, Louis (December 1974). "Nathaniel Isaacs" (PDF). Natalia. Pietermartizburg: The Natal Society Foundation (4): 19–22. Retrieved 10 August 2010. ^ Eldredge, Elizabeth (1995). "Sources of Conflict in Southern Africa c. 1800–1830: the 'Mfecane' Reconsidered". In Hamilton, Carolyn (ed.). The Mfecane Aftermath: Reconstructive Debates in Southern African History. Pietermaritzburg: University of Natal Press. pp. 122–161. ISBN 978-1-86814-252-1. This page was last edited on 7 March 2019, at 13:35 (UTC).